Conference championship weekend saw so much great action that I can barely get it into one post. Everything that is great about college cross country happens at the conference meets. We start on the left coast with what has become the toughest cross country conference in the nation. The #1 Colorado Buffaloes came into this meet as the favorites, not only because they’re #1 in the polls but because they were running at home. The high altitude at Louisville’s Coal Creek Golf Course doesn’t bother the Buffs but was a problem for the visiting teams. Still, with #4 Oregon slated to finally run All-American transfer Eric Jenkins, the possibility of an upset was real. Jenkins did not run (and is almost assuredly redshirting the season) but it didn’t matter. Colorado put on an amazing display of power, finishing 3-4-5-7-9 for a total of 28 points. Had Jenkins run and won, Colorado still would have won by four points. The Ducks did get a kind of victory, as freshman Edward Cheserek took the individual title. Washington’s Aaron Nelson had put up a solid set of races through the regular season but was not up to the task today, finishing just eighth. His #25-ranked Huskies had a difficult day, finishing fifth. #13 Stanford was third and unranked Arizona State pipped Washington for fourth by two points. Who are the five runners for Colorado who might bring home their first NCAA title since 2006? Let’s take a look. Blake Theroux (junior, Chesapeake VA): Third at the Pac-12, a marked improvement from last year’s 7th place finish and 28th in 2011. 39th at the NCAAs last year, 183rd the year before. On the track he’s a 4:01 miler/8:50 steepler and has never broken 14:00 for 5k. Connor Winter (sophomore, Centennial CO): Fourth at the Pac-12, a marked improvement from last year’s 21st place finish. 65th at the NCAAs last year. On the track he’s a 4:01 miler and has also never broken 14:00 for 5k. Ben Saarel (freshman, Park City UT): Fifth at the Pac-12. One of the nation’s top high schoolers last year, taking fourth at the Foot Locker Cross Country Championships and winning the Adidas Dream Mile with a 4:02 clocking. Pierce Murphy (sophomore, Hanalei HI): Seventh at the Pac-12, a marked improvement from last year’s 14th-place finish. 45th at the NCAAs last year. On the track, he’s never broken 14:00 for 5k. Ammar Moussa (sophomore, Arcadia CA): Ninth at the pac-12, a marked improvement from last year’s 15th place finish. 88th at the NCAAs last year. On the track he’s broken 14:00 for 5k but by just 2.04 seconds. Take a good look at those five runners. Based on past years, this is not an NCAA Championship team. Heck, it might not look like a team that could be in the top four. There is no star runner, no “low stick”. Only one runner has ever finished in the top 40 at an NCAA cross country championships, and before this weekend only one has ever finished in the top ten at a Pac-12 championships. Their track credentials are uninspiring: none have ever qualified to an NCAA Championships, none have ever won a Pac-12 title, none have ever run under 4:00 and only one has ever run under 14:00. Saarel is a legitimate star coming out of high school but he wasn’t even the top freshman runner in the Pac-12. And they’re all very young. But every single one of these runners has done something that doesn’t happen enough in college track and cross country: they’ve make big improvements from one year to the next. Massive. It’s not as if they’re hacks–these are all talented runners–but there are a lot of talented runners in the NCAA. They have made themselves a championship contender because they are not the same runners they were last year. Whether or not their improvement will be enough to win the national title won’t be known until November 23, but that they’re in the running is an amazing feat. And I’ve always said that if Mark Wetmore’s team gets to the NCAAs in one piece, they almost always run better than expected. As with the men’s race, the #1 team in the nation won the Pac-12 title. But whereas the men’s race was expected to be close and it wasn’t, the women’s race wasn’t expected to be close but it was. Top-ranked Arizona squeaked out a six-point victory over #16 Colorado, with #13 Washington third and #12 Oregon a surprising fourth. The high altitude undoubtedly helped the Buffaloes, but the race exposed a possible weak spot for the Arizona Wildcats: depth. They were quite strong through the first three runners (places 2-5-6) but then there was a dropoff, as the next two finished 28th and 32nd. A one-to-five gap of 1:28 is a bit troubling, but the high altitude could be a culprit. Arizona’s win was their first ever at the Pac-12 (from ’86 through ’10, only Oregon, Stanford and Washington had ever won the title). Colorado impressed with their second-place finish. Are they better than their #16 ranking, or did they simply take advantage of the altitude-driven home advantage? That’s a question that will be impossible to answer until the NCAA Championships. #12 Oregon looked very ordinary; while the Ducks managed a 1-to-5 gap of just 28 seconds, that doesn’t mean much when all your runners are back in the pack. The story of this meet is the Providence women’s team. They came into the meet ranked #4 in the nation after being ranked #1 for most of the early season. They’re unbeatable through their first three runners (All-Americans Emily Sisson, Sarah Collins and Laura Nagel) and as good as anyone through their fourth (Catarina Rocha) but then the bottom falls out. A weak fifth runner usually destroys a team’s chances at a championship. At their first major race of the season, the Coast-to-Coast Battle in Beantown, the Friars 1-to-3 gap was just 16 seconds, their 1-to-4 was 37 seconds, and their 1-to-5 was a deadly 78 seconds. At Wisconsin’s Adidas Invitational, their 1-to-3 gap was again 16 seconds, their 1-to-4 was 47 seconds, and their 1-to-5 was an even deadlier 96 seconds. But coach Ray Treacy’s squad may have found a fifth runner in the form of senior Grace Thek. The Melbourne (Australia) native has run just two races since last fall’s NCAA Championships, where she was the sixth runner on Providence’s runner-up squad. She won the Central Connecticut State Mini Meet, a tiny 3k race held as a conference warm-up event, and then the Big East on Saturday. She finished 13th and the Friars easily beat #3 Georgetown by the score of 28 to 47, with #7 Butler in third with 66. That 1-5 gap is manageable, and remember that Thek is hardly race-sharp. This weekend’s performance is probably not going to be enough for Providence to win the NCAAs; if that same gap had happened at the Adidas Invitational, then they’re basically neck and neck with Arizona for the win. But if Thek can make another step up from here, then Providence might be the team to beat. There is no room for error, though. The Wisconsin Badgers have a deep tradition of excellence in men’s cross country and have some remarkable win streaks: eleven straight Great Lakes regional wins, fourteen straight Big Ten wins. Early in the season it looked like those streaks were in grave danger, but two weeks ago the conventional wisdom changed. Wisconsin ran a remarkable fourth at their own Adidas Invitational and Indiana did not run well at all. Now the Badgers regained the role of favorites, albeit an iffy one. When the dust settled, the Wisconsin streak had indeed ended. The meet was still anyone’s to win at halfway but #24 Indiana closed best while the #7 Badgers faded badly. The #16 Michigan Wolverines ended up second, also beating Wisconsin. It was Indiana’s first Big Ten men’s cross country win since the Carter administration (1980). Wisconsin did get a win of sorts, as redshirt freshman Malachy Schrobilgen pulled out the individual title. This will go down as one of the bigger upsets in Big Ten history–not cross country history, but in any sport. Twenty percent of the top 30 teams in the latest poll were here, led by #6 Michigan State. The main competition was expected to come from #14 Michigan, the defending champions. The Spartans ran a controlled, team-oriented race and closed well on the muddy course to win, their third title in the last four years. Their strength is depth and it showed here, with a 1-to-5 gap of just 41 seconds. Michigan was twelve points back in second, #15 Minnesota third, and #29 Penn State fourth. A rather big surprise in fifth was Ohio State, beating two ranked teams (#21 Indiana and #28 Wisconsin). With rare exceptions, Buckeye women’s cross country has been atrocious throughout its entire history. That seems harsh but there’s no other way to put it. The only major program in a talent-rich state, this fifth-place finish was second-best in school history and just the third time they have ever been in the top half of the Big Ten Championships. New coach Sara Vergote has only been on campus for a few months but already seems to have made a difference. I mean, beating two nationally-ranked teams in a single race is no small feat–and I’m going to guess it’s happened only one other time in team history. There have been a lot of conference shake-ups over the last few years and the ACC has seen more than its share of changes. The Orangemen were one of the new additions and the #14-ranked squad came away with Syracuse’s first ACC Championship–in cross country and in any sport, period. They left the Big East as champions and came into the ACC as champions. The standings went true to form, with #18 North Carolina second and #23 Notre Dame third (in their ACC debut). Senior Andrew Colley (NC State) won the individual title in a runaway, bursting from a pack at halfway en route to a win by nearly 25 seconds. Did you know that the Florida State women won the Pre-National Invitational three years in a row, from 2010 to 2012? And did you know that this is the first time since 2009 that Florida State hasn’t been ranked first or second at this point in the season? And in only one of those years did the Seminoles actually finish first or second in the NCAA Championships? All this underscores what coaches always say: rankings mean nothing and you have to win it on the field. Right now the Seminoles are #5 in the polls…and yes, that means diddly-squat. They won the ACC title on Friday, their sixth in a row, but even that was in doubt until late in the race. The ‘Noles were in trouble partly because Pippa Woolven, usually their third runner, had been ill all week. She struggled through the race and was beaten by four Virginia runners, but ultimately Florida State prevailed by 13 points over the #10 Cavaliers. #19 Syracuse finished third and #22 Notre Dame was fourth. Unranked Duke was fifth; the Blue Devils had been mentioned as an NCAA Championships contender early in the season before cratering in October, but here they beat #27 Boston College. Duke did bring the individual champion, former NCAA 10k champ Juliet Bottorff. This was her third win in four races this fall but she didn’t do so well in her major test, Wisconsin’s Adidas Invitational, where she finished eleventh. The Oklahoma State Cowboys opened the season as strong favorites to repeat as NCAA champions. They dominated #2 Northern Arizona at their own Cowboy Jamboree. They’ve mostly been in hiding since then and have fallen to #3 in the polls. The Big 12 Championships loomed as a chance to show that they’re still in the hunt. The Cowboys didn’t. They won, of course, besting Iowa State by the score of 33 to 77. They put all five scorers in the top 12. But that’s not the formula for an NCAA title, not when Colorado packs five in the top nine in their conference meet and against tougher competition. Their top three of Kirubel Erassa, Shadrack Kipchirchir, and Tom Farrell all ran as well as expected, but then there were problems. The biggest problem was Joseph Manilafasha. He was an All-American last fall, taking 24th at the NCAA Championships as the Cowboys’ third runner. He was 7th at the Cowboy Jamboree, more or less where you would expect him. He bombed at Pre-Nats with a 66th-place finish, and here he was 40th and the Cowboys’ tenth man. Something is clearly wrong and it does not look like he’ll be able to help his team in their final two races. The big winner of the race was unranked Iowa State, defeating #29 Texas and #27 Oklahoma. Note that ISU’s new head coach is Martin Smith, hired away from Oklahoma in June. The Cyclones are on the upswing and the Sooners appear in disarray. Texas Tech’s Kennedy Kithuka destroyed another quality field, winning by 38 seconds. He still has yet to lose an NCAA cross country race. #8 Iowa State won with ease, putting all seven runners in the top twenty, which was expected given they were the only nationally-ranked team in the race. The individual title went to Texas’ Marielle Hall, who ran her second straight outstanding race (she was 3rd at the Adidas Invitational). #12 Arkansas was the only ranked team in the meet and had a big win on the back of a 1-2-3 finish. Lead runner Kemoy Campbell is the only man who has been at all close to Kennedy Kithuka this year, and here he impressed with a win by 42 seconds. The Hogs don’t have the depth to make a big splash at the national championships, as this is a team built for track season: a few very good runners who can score a lot of points. I haven’t looked it up to be certain, but this might be the first time that Arkansas’ women’s cross country team is ranked higher than the men’s team. Right now they’re #2 and the only SEC team appearing in the poll. They won over Texas A&M by the score of 32 to 123 on the back of a 1-2-3 finish. The men’s championship went to close to form, with #9 New Mexico winning big, #22 Colorado State second, and #28 Air Force third. #20 Boise State had a rough day and finished fourth. Air Force provided a surprise winner in Isaiah Bragg, who broke the Falcons’ home course record. The women’s championship went exactly to form, with #9 New Mexico winning big over #25 Boise State. The Broncos’ Emma Bates, who has been one of the nation’s best runners so far this year, won the individual title in course-record time. The WCC now has the strongest intra-conference rivalry in men’s cross country. Two years ago BYU joined the conference and broke Portland’s 32-year win streak, and then last year Portland beat BYU by a single point. There’s a lot on the line in this meet based on that history alone, but BYU and Portland are also #5 and #6 in the country. The Cougars ended up winning the meet without much challenge, controlling the race from the start and putting all five scorers in front of Portland’s third. The WCC is basically a dual meet–the two teams combined for 13 of the top 17 finishers. The individual title went to BYU but not favorite Tylor Thatcher. Senior Jason Witt went from third to first in the final 400 meters. San Francisco, the lone ranked team in the women’s race at #17, took the team and individual titles with Bridget Dahlberg coming home the winner. The pre-meet favorite was #10 Columbia but #15 Princeton loomed large as a threat. We’ve seen this before; last year Columbia came into the Heps Championships ranked 10th while Princeton was ranked 23rd, but the Tigers came out with their third straight win. Could Princeton pull the upset again and be the first to win four straight since Vin Lananna’s Dartmouth teams of ’89-’92? No, they couldn’t. Columbia pulled out a tight eight-point win on the strength of their first three runners, who all finished before Princeton’s first runner came across the line. An unranked Dartmouth team took third, ahead of #21 Harvard in fourth. The Crimson did get a big win out of Maksim Korolev, besting the runner-up by sixteen seconds. 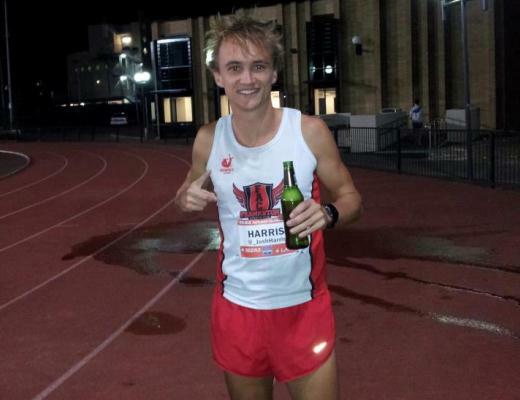 The talented but inconsistent senior has now strung together two top-notch races after a runner-up finish at the Adidas Invitational two weeks ago. #11 Dartmouth and the Big Green’s Abbey D’Agostino were heavy favorites to win here and neither disappointed. The team brought five across the line before anyone else had three in, and D’Agostino broke the meet record for margin of victory, leaving Columbia’s Waverly Neer some 40 seconds in arrears. #24 Cornell, the two-time defending champions, came up for second. #23 Princeton had a rough day, finishing fourth behind unranked Harvard and just six points out of fifth. The interesting race at this meet was on the women’s side. Ohio University’s Juli Accurso ran with the leaders for the first half and then put about 150 meters on the field in the last 3k to win a record third consecutive title. Where it was really interesting was the team race. The Toledo Rockets have more national name recognition than any other mid-major women’s cross country team that has never finished higher than 21st at the NCAA Championships, and not in a good way. Changes like the one the Rockets went through over the last nine months are never smooth. Saturday’s race was not smooth. At the 3k mark in the 6k race, the Rockets had five runners in the top twelve or so and looked to have the race in the bag–but looks can be deceiving, and the race wasn’t over. Miami’s top runner, Jess Hoover, was in the top four during the entire race but at the halfway point, none of her teammates were in the same pack as Toledo’s top five. They made a remarkable surge over the last half of the race to put four runners in the top ten while Toledo’s pack faded. When it was all over, the Redhawks won by a scant three points. Forget any backstory about the Toledo situation–that’s just tremendously gutsy running by Miami’s women. Why am I writing about a third-tier conference meet which will probably get only a single runner to the NCAA Championships? Because the kind of attention this meet gets is a perfect example of what college cross country is about. No, make that college sports in general. My favorite sportswriter knows nothing about college cross country but he knows exactly why you and I care about it. Joe Posnanski, former columnist for the Kansas City Star and Sports Illustrated, writes “curiously long posts” about whatever he might be thinking about at the time. He’s perfect for the world of blogging. Two years ago he wrote a typically long and rambling (and smart) piece about the biggest issue facing college sports right now, whether or not college athletes should be paid. He offered up a hypothetical: what if every member of Auburn’s football team left and reformed as a minor-league football team? How many fans would come out to see them play? Would it still be the 80,000+ that come out to see Auburn? There is, of course, no way to answer this question…but we all have to suspect their fan support would be minimal. We care about college sports not because of the athletes, but because of the colleges they represent. I care about Michigan because I’m a proud (and left-wing) Midwesterner, I care about Ohio State because I’m a proud Ohioan, and I have a deep emotional (and very complicated) connection to my beloved Bowling Green Falcons because I attended that university and it gave me virtually everything I have in my adult life. And Posnanski understands this very well. Cross country the same, but it’s different. We care about the teams we cheer for often because we were on those teams, or at least wished we were good enough to have walked on. And the fact that “stadiums are for spectators, we runners have nature” means the connection between us and our teams are personal. 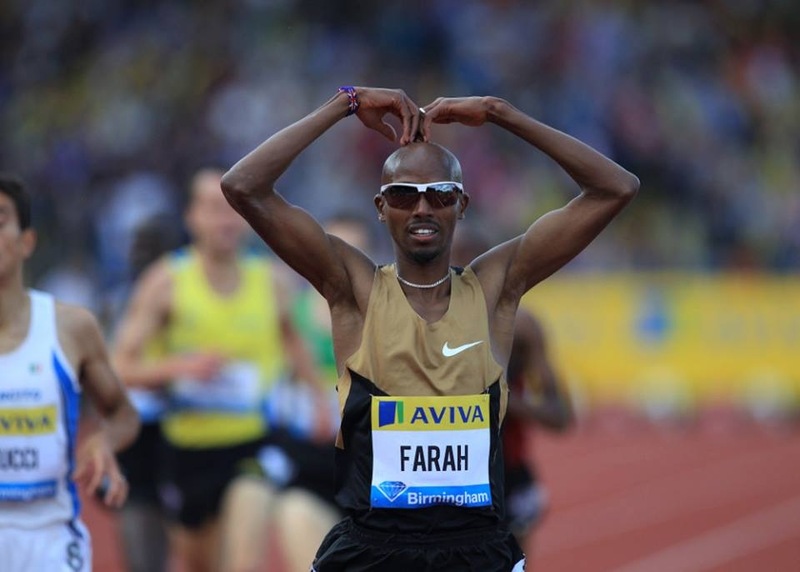 We can be inches away from the athletes we cheer for as they run by. We can walk right up to them after the race, shake their hands, and offer words of encouragement. Take Craig Leon, for example. Currently #8 on the 2013 US marathon list, he was a walk-on at Ohio University and improved drastically over the years he ran there (and even more since then). 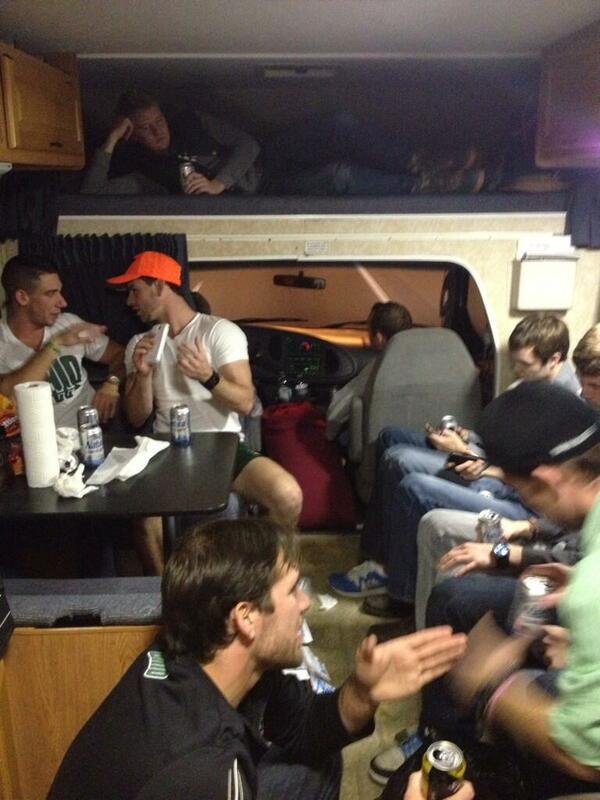 He and his former teammates apparently take an annual trek to the MAC Championships in a rented RV for the kind of rollicking good time that guys in their 20s are going to have. It would have been nice for the Bobcats to have won, but that wasn’t the point of the trip. The point was to see them run and to have an excuse to have some fun. 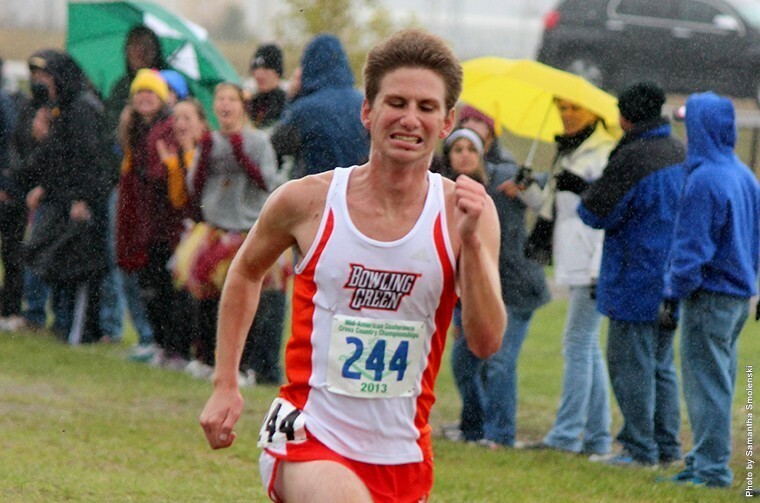 My Bowling Green Falcons haven’t had much success lately–there is no men’s track program any more and the men’s cross country team has no scholarships–but even modest improvement can fill an alumni with pride. The women’s team finished sixth in the 12-team field, their best result in five years. And the men’s race provided something I did not expect at all: an All-MAC runner. Senior Jason Salyer was in eighth place with a mile to go and fading, but when he came around the final turn he was in sixth (top seven are all-conference). It ended an eighteen year long dry spell in All-MAC runners for BG; the last guys who did it had been my teammates. I went home with a big grin on my face. Here’s the point: 98% of NCAA cross country teams aren’t going to win a trophy at the national championships, and 90% of teams aren’t even going to be there. We spend all of our time talking about those 2% and 10%, when there are so many teams all over the country. Every team matters to someone, and they’re willing to stand in the cold and the rain and the wind and the muck to cheer them on. Ho hum, another 38-second win over a two-time All-American. He thrashed the SEC by 42 seconds. His ACC Championships win might have been the best race of his career, or at least the best in a while. She might be more unbeatable at the NCAAs than Kithuka. The sudden emergence of Thek as a viable fifth runner means Providence has a legitimate chance at winning the NCAA title. She might be the next best runner in the NCAA after D’Agostino. It’s notable when a lowlander breaks a course record in Colorado Springs (elevation: 6000 feet). The Hoosiers were ranked #24 but knocked off the #7 team (Wisconsin) and broke the most remarkable winning streak in Division I cross country. As Joe Biden would say, “This is a big f***ing deal, man”. Until this weekend, they did not have a realistic shot at the NCAA title. Now, they might. The NCAA’s #2 women’s team, Arkansas, beat Texas A&M by 91 points at the SEC Championships. The CIS’s #1 women’s team, Guelph, beat Texas A&M by 82 points at the Greater Louisville Classic. 7. Andrew	Colley, North Carolina St.
Cheserek looked unbeatable as he blasted away from the next few guys with 400m to go in the Pac-12 meet..Note that next year Colorado returns its top 7 plus will have Jake Hurysz, back, he’s redshirting due to injury this year. You’re missing a couple of guys from UNC-Greensboro in your top 10.